Below is the 2018 season recap for the Cincinnati Bengals. The Cincinnati Bengals stumbled to a 6-10 record in 2018, limping their way to the finish line after losing three star players on offense, including perennial All-Pro wide receiver A.J. Green. Andy Dalton seemed to be putting together one of his better years, earning three grades of 85.0 or higher prior to his season-ending injury. 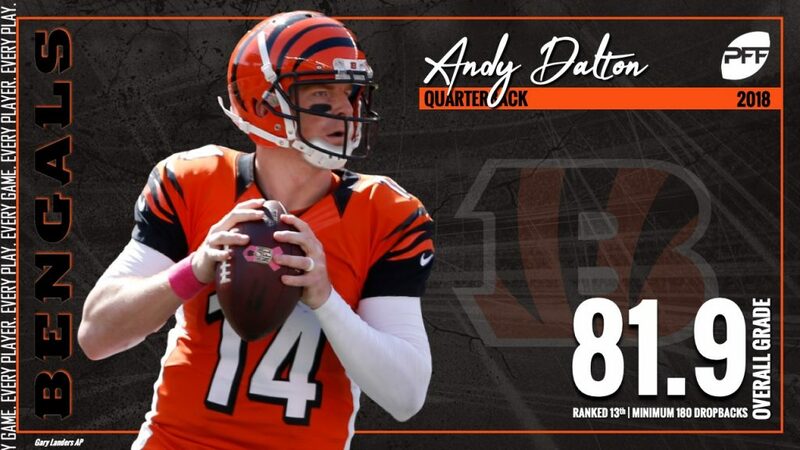 Dalton finished this season with an 81.9 overall grade, the highest mark of his career. 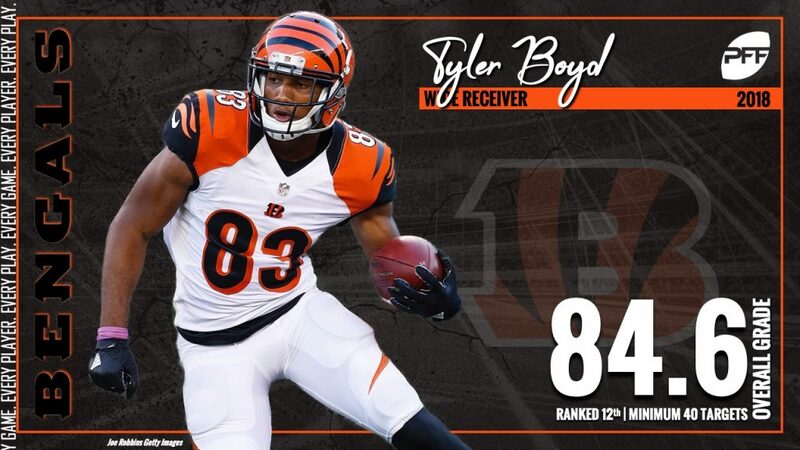 Tyler Boyd (84.6) broke out this season and gave the Bengals a viable receiving option outside of Green and Eifert, producing a career-best mark for yards, receptions, touchdowns and overall grade. 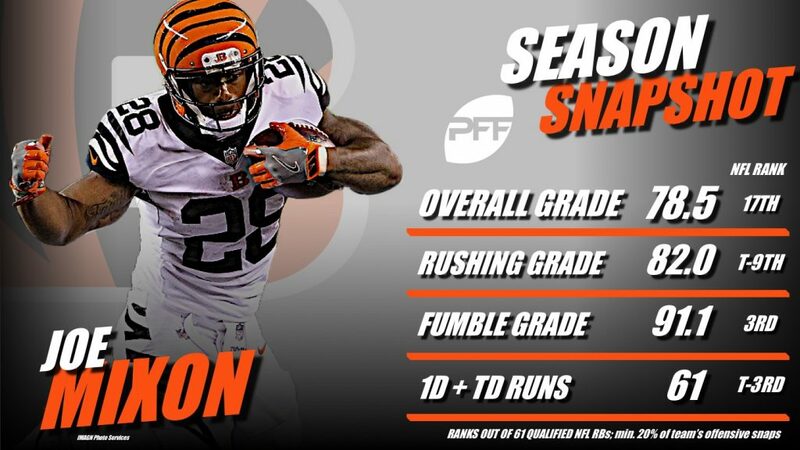 Joe Mixon improved upon his overall grade from last year (72.6 to 78.5) and was top-five in both rushing yards (1,171) and runs that went for 10 or more yards (34) among running backs this season. The Bengals’ defense has plenty of talent, yet was historically bad this season, becoming the first team in the Super Bowl Era to allow over 500 yards of offense in three straight games. 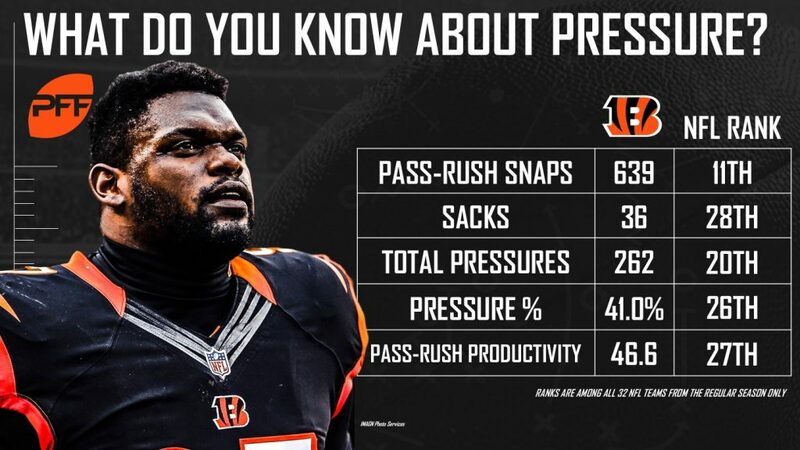 Despite boasting a deep defensive line unit led by talented veterans Geno Atkins and Carlos Dunlap, the Bengals failed to put pressure on the passer and registered just 36 sacks and 51 QB hits this season. The coverage unit didn’t do much to help, either, producing just 12 interceptions and 41 pass deflections while allowing 31 touchdowns through the air. Injuries to players like A.J. 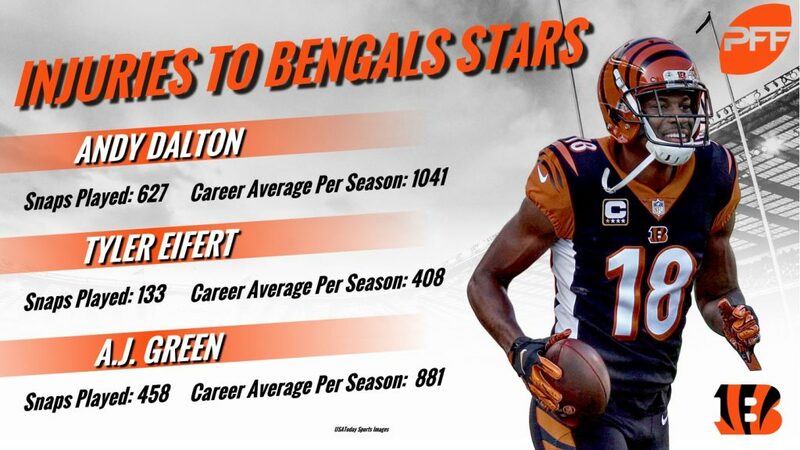 Green, Tyler Eifert and Andy Dalton seriously lowered the offensive ceiling for the Bengals. Losing Carl Lawson early to a torn ACL and dealing with nagging injuries at an already slow linebacking corps exposed and further compounded the issues plaguing the Bengals’ defense. Green was slowed to just nine games but still saw 77 targets and recorded 2.39 yards per route run, tying with Mike Evans for the eighth-best mark among receivers. Atkins was still as dominant as ever as a pass rusher. His 64 total quarterback pressures ranked fourth among all interior defensive linemen. 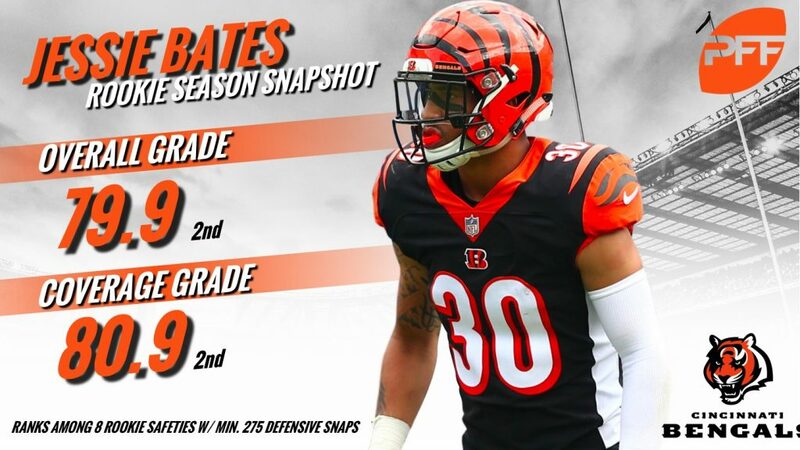 Tyler Boyd broke out in a big way in his third NFL season, earning an overall grade of 84.6 after failing to grade out higher than 65.1 in his first two seasons. He finished as the 12th highest-graded receiver and was sixth in passer rating when targeted (127.8), giving the Bengals a legitimate receiving threat across from A.J. Green. Second-round safety Jessie Bates was able to break up four passes and intercepted three of them, good for a 59.9 passer rating when targeted (9th among qualifying safeties). His overall grade of 79.9 is the 12th highest among safeties this season and third among rookie safeties. After a blistering start, the loss of quarterback Andy Dalton and the poor play of Jeff Driskel in his absence was too much to overcome. That, coupled with a defense that became the first team in the Super Bowl era to allow at least 500 yards in three straight games meant led the team to their third consecutive losing season.